Despite promises of moving its triennial conference from El Aaiun, occupied Western Sahara, to a city in Morocco proper, ISOCARD now states it will not do so, because "it has no power to change the city" - indicating the organisation's lack of backbone to go against its Moroccan hosts. 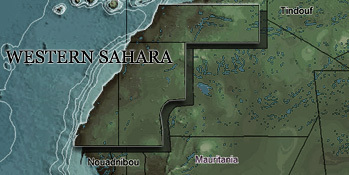 In response to concerns raised by Western Sahara Resource Watch (WSRW) about its plans to host its triennial conference in El Aaiun, occupied Western Sahara, the International Society of Camelid Research and Development (ISOCARD) stated in May this year that "The Executive Council discussed your distinguished message and voted yes to change the current city and choose another city (should be big and has international airport). A letter has been sent to the host organizer to change the current city to another city within one month." Turns out ISOCARD did no such thing. On 9 August 2018, ISOCARD launched a webpage dedicated to the conference, which still mentions the capital city of occupied Western Sahara, El Aaiun (using French spelling Laâyoune) as the conference venue. The above included photo is a screenshot of the conference website. WSRW has aked ISOCARD to clarify whether or not its event will be hosted in Western Sahara. Yesterday, 20 August 2018, the Secretary General of ISOCARD, Dr Abdulwahhab Al-Juboori, responded by shifting all responsibility to the host organizer - the Moroccan "Institut Agronomique et Veterinaire Hassan II"; a Rabat-based veterinary state-funded institute named after the former Moroccan king who decided to invade Western Sahara. "It is not the responsibility of the ISOCARD to select the host city that falls on the organizing committee. The EC members of ISOCARD fully understand your concerns and have conveyed this to the organizing committee more than once, however it has no power to change the city", Dr Al-Juboori writes. ISOCARD had scheduled its conference to take place from 12 to 15 November 2018, in a location it describes as "Laâyoune, Morocco". WSRW on 27 March 2018 contacted the organisation with the request to move the conference location to Morocco proper. WSRW also wrote to the organisation's 260 members with the same request. The decision of ISOCARD's executive committee to instruct its host organizer to move the conference was published on our webpage on 3 May 2018. It is not the first time that ISOCARD is dishonest in relation to the planned conference. Before being confronted by WSRW in March this year, it boasted having the financial backing and participation of the UN Food and Agriculture Origanisation (FAO) and the World Organisation for Animal Health (OIE). Both organisations have written to WSRW that they have nothing to do with the conference in Western Sahara. The names of FAO and OIE have since been dropped from the available conference material. "We find it surprising that your organisation – based on your claim to operate non-politically - still claims to have the event in Morocco, which is not the case", WSRW stated in its letter sent to ISOCARD today. If ISOCARD chooses to proceed with holding its triennial conference in the last colony in Africa, it has to review its objectives, as it can no longer be regarded a non-political society. It would also have to accept responsibility for bowing to political interests of host organisers, even if that would entail becoming associated with a brutal and illegal occupation.